"3LA1, V-1122" by Timothy K. Perttula and Robert Z. Selden Jr. CONTEXT INFORMATION: Found in a plowed-out grave that was excavated by Dan Jenkins in 1934. The vessel is associated with V-1122 to V-1136 and V-159 to V-162. 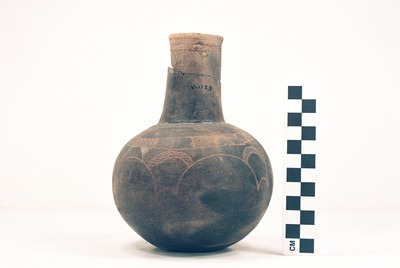 DECORATION: There are three horizontal engraved lines on the bottle neck near the rim; the lowermost engraved line has small attached tick marks. Near the top of the vessel body is a horizontal engraved band filled with five rectangular zones of cross-hatched engraved lines. Below this is a series of five alternating and connected large and small engraved semi-circles; the large semi-circles are also connected by narrow curvilinear cross-hatched bands.